We’ll spell it out: L-O-V-E. 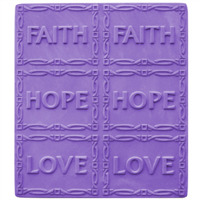 Inspired by Art Nouveau designs and sculpted with tender flower details, our gorgeously rendered Tray Love Soap Mold is perfect for expressing your happiness with family, friends, and life itself. 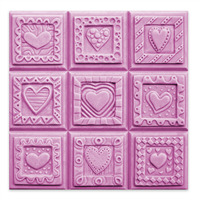 This mold features multiple cavities to create eight individual bars of LOVE. 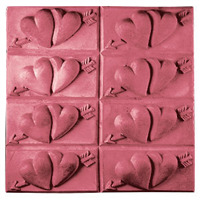 Perfect for weddings, anniversaries, and Valentine’s Day. COMMENTS: I just got this, delivery was fast and mold is excellent. Nice and sturdy. Nice size bars. Easy to cut. COMMENTS: I like this mold. It makes a great little bar. 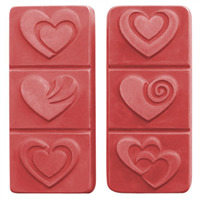 COMMENTS: I used these for Valentine's Day and folks loved them! Easy to cut soaps as well. "So Versatile For Many Occasions. " 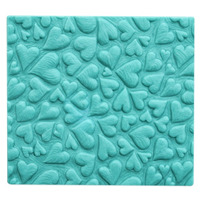 COMMENTS: This mold can be used for Wedding Favors, Anniversary Favors, Valentines Day, Birthday, or any occasion where the message of love needs to be portrayed as a gift for favors. COMMENTS: Soap looks great from this mold. Especially lovely when the details are highlighted with a dusting of mica. Would make great wedding favors. COMMENTS: These make such nice, attractive bars of soap. Customers love it!